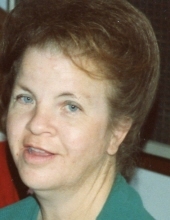 Linda Lou Richardson Gray, age 70, died Thursday April 12, 2018 at Saint Joseph East in Lexington, KY she was born in Richmond, KY on February 15, 1948 to Hazel White Richardson and the late Ambrose Richardson. She had worked as a nursing assistant at Berea Health Care. Mrs. Gray loved her flower gardens especially her Iris’ and Violets, she also enjoyed crocheting and quilting, her home and singing for the senior citizens center. Mrs. Gray was of the Pentecostal faith and attended the Hickory Grove Pentecostal. Other than her father she was preceded in death by her husband, Delmer Gray. She is survived by her mother, Hazel White Richardson of Berea, KY her son, Ronald D. Brown and his wife Melissa of Crab Orchard, KY her daughter, Stacy Ilene Stinson and her husband Kevin of Berea, KY her sister, Kathy Hembree and her husband Marty of Berea, KY her brother, Clyde Richardson of Somerset, KY three grandchildren, Tyler, Nickie, and Ruth Brown. A great grandson Rhett Nathaniel Brown and several nieces and nephews also survive. To send flowers or a remembrance gift to the family of Linda Lou Gray, please visit our Tribute Store. "Email Address" would like to share the life celebration of Linda Lou Gray. Click on the "link" to go to share a favorite memory or leave a condolence message for the family.